Skye Gravestones | Hector & Rachel (McKinnon) McKenzie & family. Hector & Rachel (McKinnon) McKenzie & family. RACHEL McKENZIE/in loving memory of/her husband/HECTOR McKENZIE/who died 15th Novr. 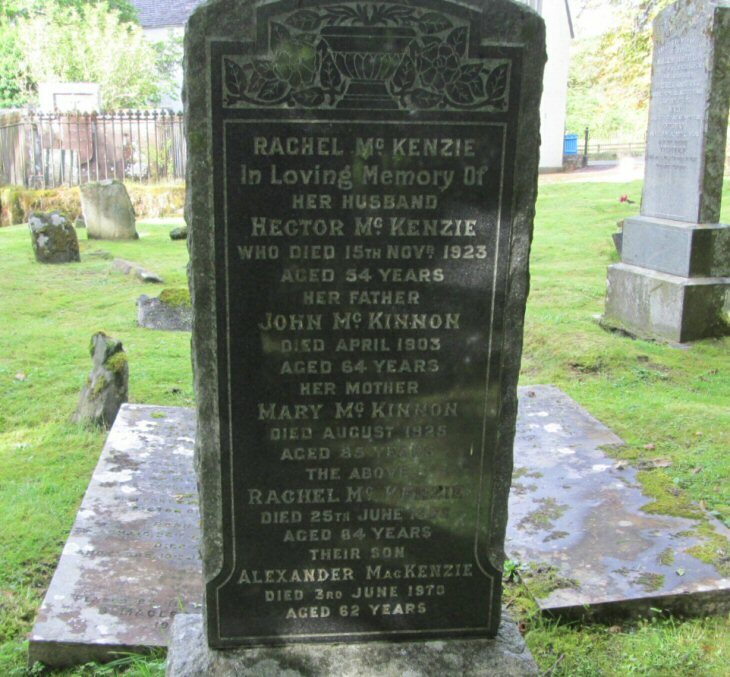 1923/aged 54 years/her father/JOHN McKINNON/died April 1903/aged 64 years/her mother/MARY McKinnon/died August 1925/aged 85 years/the above/RACHEL McKENZIE/died 25th June 1958/aged 84 years/their son/ALEXANDER MacKENZIE/died 3rd June 1970/aged 62 years/["recent"].